Product #1180 | SKU 400 | 0.0 (no ratings yet) Thanks for your rating! 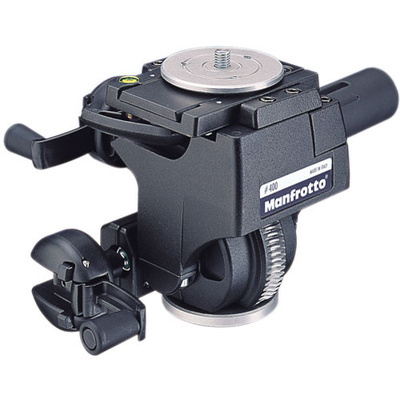 The Manfrotto 400 Deluxe Geared Head is a heavy-duty head designed primarily for use on studio column stands or larger tripods, and for use with large or medium format cameras. It offers the ultimate in precision 3-way geared adjustment and control. Self-locking foldaway cranks allow 360° panning, +30° and -90° of frontal tilt & +/- 7.5° of lateral tilt. Side to side levelling is controlled by a separated handle. The bubble level aids in precise positioning. The availability of three different heights of quick release plates eliminates the nuisance of interference of camera standards, which is critical for use of fast wide angle lenses. In addition, the tension holding the round quick release plate can be released to allow fine adjustment with complete safety. Replaces old part number 3263.